As a proof that solar energy can be accessible to common Filipinos, Greenpeace Philippines gathered financing institutions and solar providers to give energy consumers an easy access to financing options available in the market. It'll ultimately help in increasing solar energy use in homes and businesses. Getting such packages will spread the initial cost of putting solar installations over the long term while saving electricity cost. In particular, solar rooftops are highlighted. It can create huge large impact in lowering monthly electricity bills. Having such package will get financial assistance to have the opportunity to get be powered by solar energy and break away from dependence to fossil fuel generated electricity. "Now is the best time to switch on the power of renewables for each home and business to be at the forefront of our fight against catastrophic climate change. The call for the uptake of solar energy is not an empty appeal to each individual's altruism but, as we are attesting today, incentives await in the form of cheap and reliable energy. Financial solutions are widely available from many institutions, and after today, we are expecting more. For both homes and businesses, renewable energy is the way to go," said YebSaño, Executive Director of Greenpeace Southeast Asia. As renewable energy sources grows, the Philippines is currently producing 29 perfect of its electricity through the use of such sources. Then the Department of Energy is looking to raise it to 40% by 2020. That's something that will make electricity cheaper and even help in preserving our environment in the end. Plus, the mainstream adaptation of renewable energy will only result in creation of jobs and allow households to have more savings in the their budgets. "It is important to note that while large-scale solar power plants are being constructed and going online in the Philippines, there is still a huge amount of solar energy potential that remains untapped. This is where solar rooftop installations on homes, schools, hospitals, and businesses can complete the picture of a country like the Philippines moving towards a higher share of renewable energy in its power generation mix. The energy revolution will happen right on the rooftops of Filipinos' homes," said Reuben Muni, Climate and Energy Campaigner of Greenpeace Southeast Asia Philippines. “A strong relationship between the public and private institutions, as well as progressive legislations, should boost our transition to renewable energy. It encouragesand provides incentives to more people and businesses who opt to use the technology,” Muni added. As a proof that this technology works, Wilson Lee Flores, columnist and owner of the Kamuning Bakery Cafe, shared how his decision to use hybrid (partly solar-powered air-conditioning system) in his 77-year-old cafe lowered his electricity bills drastically. 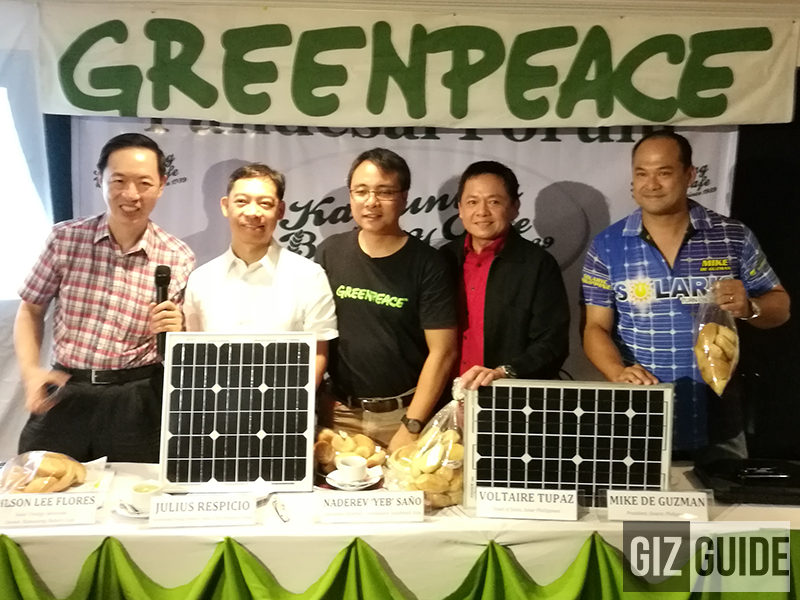 In that press-con, Greenpeace Philippines also highlighted the Solar Rooftop Challenge, its benefits, busting misconceptions, and its long term benefits for everyone. For more info about Greenpeace, visit their website now.